Caroline Hennessy had some misgivings about her plan to rear and then kill the family turkeys for Christmas and Thanksgiving but, after the Turkey Killer did his job, she gained a fresh appreciation of the festive feast. As published in the Irish Examiner on Saturday 18 December, following on from A turkey for the table. I wasn’t entirely sure I could go through with it. 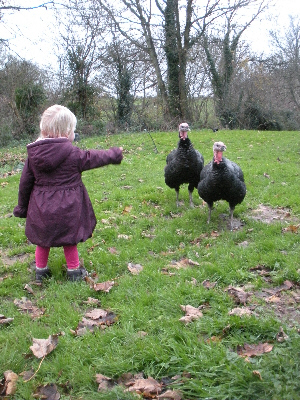 The theory of eating my own hand-reared turkeys was all very well and good. However, on the night that the man known as The Turkey Killer was to call I still didn’t know how I felt about the reality. I had made things very clear from the start. The pair of awkward-looking eight-week-old Bronze turkeys that came to live at the bottom of the garden in September were not pets: they were dinner. Scott, the husband, was fine with that. Being from New Zealand, he was well used to hunting, fishing and dispatching animals for the pot. Although 20-month-old Hannah was fascinated with the turkeys, they always avoided her open-armed embraces so – I hoped – she wouldn’t notice their absence. One of her favourite jobs was feeding them though; every morning she took her little bucket of turkey breakfast out to their run to loud, appreciative gobble-gobbling. Food consumed, the lads were allowed out to roam. Despite having half an acre at their disposal, they preferred to wander over to the hen run and eyeball the ladies. The turkeys would then patrol up, down and around the enclosure, finally settling down in a sunny spot for a day of chilling out, with occasional forays for grass or windfall apples. I was all for the relaxation side of things: I needed these turkeys to sit still and concentrate on putting on some weight rather than perambulating around the garden. Even as their hour of death approached, I was quietly amazed that they managed to survive for three months. Their pen was made from wooden pallets so that we (by which I mean Scott) could move it around the garden easily. Our terrible twosome, however, were good at finding and exploiting any gaps. On many an early morning I glanced out the window to see two dark, long-necked shapes already wandering over to wake the hens. For once, the lack of neighbourhood foxes – a situation that we regularly lament while watching rabbits feast on our veggie seedlings – turned out to be a mercy. Despite the lack of intelligence which had initially irritated me, I did soften slightly towards the lads. Full-grown Bronze turkeys – they were taller and wider than Hannah – are magnificent to look at, especially when they preen and fluff out their tail feathers. Despite this majesty, there’s still considerable entertainment value to be had from their comical side-to-side run, wings flapping madly for balance. Believe me, these birds aren’t built for speed but they certainly do add noise and colour to a winter garden already populated with stalking cats, crowing hens and a busy toddler. Despite the Bronze being a slower growing variety than the usual white turkey, our duo rapidly put on weight. This was fortunate as we planned on killing the pair in time to eat one for Thanksgiving. My 94-year-old Granny, a regular source of advice for cottage projects, kept warning me not to invite too many people to dinner as she couldn’t see how they would have put on enough weight in time. I was having the opposite dilemma. In their last week of life I was trying to visually weigh them, trying to figure out how much of their bulk was feathers and hoping they could be squeezed into the oven. But before that, they had to die – or, as Barbara Kingsolver would put it, be Harvested. This caused a lot of discussion. It was tempting to take the easy way out: a butcher friend offered to “look after them” for me and I heard of a place in Cappawhite that takes live turkeys in one end and delivers freezer-bagged fowl out the other. While convenient, I felt this was a bit of a cop out. Lulled by well-wrapped, bloodless supermarket joints of meat, it is all too easy to forget the effort and cost involved in raising an animal for food. I had fed and watered and cleaned out and cursed and, in the end, reluctantly admired the antics of these turkeys. It’s not something I would recommend for everyone, but I was determined to see the project through to its logical end. Scott was all for sharpening the axe but, as I have a friend who tells us on an annual basis how he was chased by a headless turkey as a child and traumatised for life (he exacts revenge every Christmas dinner), this was rapidly vetoed. The more research I did, the more I realised that it was a specialised job. I didn’t want them to suffer needlessly – or have the meat damaged. Fortunately, I got a tip off about the local Turkey Killer (actually William from up the road) so I called and made a date. I couldn’t look the turkeys in the eye on Harvest day. They had to fast for 24 hours prior to death so, after making sure they had plenty of water in their pen, they were left to their own devices. At 7pm on the dot there was a heavy knock on the door: William had arrived. There was no fuss, just pure matter-of-fact efficiency, as he dispatched the duo, one at a time underneath the (very seasonally appropriate) holly tree. Hannah and I worked on the de-feathering side of the business. She shooed the mesmerised cats away from the turkey’s lifeless, bleeding head while I plucked furiously before the body cooled. Curiously enough, once I saw them dead, it was all simple: my fingers knew what to do and suddenly they looked a lot like dinner. After a few days hanging, my mother cleaned them out. Getting back to the familiar routine of childhood, the table was covered with newspaper before she tackled the beasts with a sharp knife. The smells and squelchy sounds were an instant reminder of being a small girl, peering over the table edge to watch Mammy as she named and pointed to the innards for curious eyes. Now I had my own daughter standing on a kitchen chair to get a good view of this early biology lesson. After cleaning they weighed in at an eminently respectable 8 and 10 kilos (almost 18lbs and 22lbs). Not bad for turkeys killed early and heavy enough to ensure an apology from Granny! After half-filling the freezer with the larger of the two for Christmas Day, we tried out the other for Thanksgiving. Did it taste good? After all the minding and looking after, I’ve never quite appreciated a turkey in the same way before. From the festive meal itself to every scrap of the leftovers (I finally got my long-awaited turkey and brie sandwich) and the bones for stock (it makes an amazing split pea soup) there was nothing left of that turkey other than a few stray feathers blowing about in the yard. Total: €65 for two turkeys. Oven ready Bronze turkeys are normally priced between €60-80 each. Sounds like you all had lots of fun on the turkey adventure. Thanks for including the economics of it all too – very interesting. Of course, there’s no mention of my time in the economics of it all – or the pleasure that we got out of having them around! They were an exceptionally rewarding crop to grow and harvest. Might even have to go there again for next year.